William Domostoy, age 91, of Mt. Lebanon, formerly of Beechview and Brookline, passed away peacefully Thursday, January 31, 2019. Born April 8, 1927 in the South Side, son of the late Michael and Annette (Stefanosky); preceded in death by his beloved wife, Elizabeth Jane (Brooks) Domostoy; brother, Michael; sister, Susan Garland; brother, Paul; and sister, Elizabeth Bucci. Bill and Betty had six children including their beloved son, Billy, who at age 10 was called to be one of God's angels. Growing up on the South Side of Pittsburgh, Bill worked from a young age, selling wood at age 8, delivering the Pittsburgh Sun Telegraph, moving up to driving cars for a service station at age 12, and milk trucks at age 14. Bill was part owner of the Original Brookline Pizza in the 1960's. He was employed for 38 years by the Olbum Furniture Company, whose slogan was "3 Rooms for $398." He was a member of Teamsters Local Union #249, and a lifetime member of the VFW. 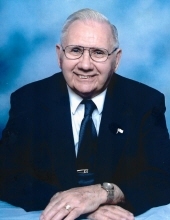 A World War II Veteran, he joined the US Navy at age 17, serving on the USS Fox, his training was to be part of the US invading forces in Japan, he served in the Pacific Theater, and was stationed at Yokosuka Naval Base, Japan. After an honorable discharge, he returned to graduate from South High School. Bill is survived by his children, Lynn (Hal) Plusa, David (Michelle), Jayne (Mark) McDonald, Kenneth (Mary), and Wendy Domostoy; 11 grandchildren; and 9 great-grandchildren. Bill was one of the "Greatest Generation" as he was industrious, inventive, kind, loving and generous to both family and friends. All are welcome Sunday, Feb. 3, and Monday, Feb. 4, 2-4 & 6-8 PM at the JEFFERSON MEMORIAL FUNERAL HOME, INC., 301 Curry Hollow Road, Pittsburgh, PA 15236. A Blessing Service will be held Tuesday, Feb. 5, 10 AM, in the funeral home chapel. In lieu of flowers, contributions may be made to Children's Hospital of Pittsburgh. To send flowers or a remembrance gift to the family of William Domostoy, please visit our Tribute Store. "Email Address" would like to share the life celebration of William Domostoy. Click on the "link" to go to share a favorite memory or leave a condolence message for the family.